The well preserved earthwork remains of a deserted medieval farmstead are visible as a series of rectilinear enclosures and depressions. The settlement may have contained three houses and half a dozen ancillary structures. Centred at SS 8877 4242, at 330 metres Ordnace Datum, is an area of desertion covering 1.5 hectares of well grazed pasture. The east and west sides are bounded by deep stream courses, dry in summer, with a third intermediate and tributary one which effectively separates the settlement into two parts. The eastern part, at SS 8882 4244, lies on a very slight southwest slope. Most prominent is a rectilinear yard or enclosure 33 metres by 10 metres, formed by a turf covered earth and stone bank 0.5 metres high. From it similar banks extend east and west to the old stream cuttings, creating a northern boundary beyond which there is rough pasture on a 1 in 5 slope becoming precipitous towards East Water combe. The enclosure has an entrance gap of 3 metres at the centre of the southern side, flanked on the west by a remnant of bank 12 metres long. To the south east are four rectilinear depressions, 0.1 metres deep, each about 5 metres by 3 metres, open on the lower southwest ends. A larger one 9 metres by 6 metes, and 0.2 metres deep, incorporates a single earthfast slab 1.2 metres long and 0.1 metres high. This is in the southwest beside a probable entrance gap. 25 metres south east of the primary yard or enclosure a stance, 15 metres by 10 metres has been cut into the slope to a depth of 0.8 metres and contains traces of a structure 12 metres by 6 metres, with an entrance in the south east and access by a passage along the south west side. This seems to be the only house in this part of the complex, the other depressions denoting pens or outbuildings. There are two incomplete enclosures abutting the southwest end of the large yard. It is uncertain if these represent buildings and from one a track like depression 0.1 metres deep runs to the stream channel. Its purpose is obscure for although the stream evidently issued near this point the subsequent cutting is 4 metres deep with precipitous sides, certainly inaccessible to cattle. From near this end of the cutting a linear hollow, 4 metres wide and between 0.4 and 1 metres deep, extends for 35 metres to the south east with a cropmark continuation to the moorland hedge, beyond which there are no traces. Perhaps a hollow way but the possibility of a former spring line cannot be discounted. From the northern end of the above mentioned hollow there is 15 metres of blank ground and then another angular hollow 20 metres long and 3 metres wide occurs, cut 0.5 metres deep into a local slope. If this is part of the hollow way the whole is oddly discontinuous and takes a curious route, but both ends seem deliberately rounded as if the feature is complete in itself. Desertion in the western part (in which the second hollow occurs), at SS 8874 4243, is on a north slope of 1 in 6, leading to the convergence of the intermediate and western dry stream gullies. In the south are two rectilinear stances, 19 metres by 6 metres, and 14 metres by 8 metres, cut into the slope to depths of 0.5 and 1 metres respectively. Each could represent a house site and the wider one has evidence of a structure 10 metres by 6 metres with a possible entrance near the northeast corner. The narrower western stance is alongside the gully and within a few metres of a constriction that is now used as a crossing place for farm vehicles, but may have earlier origins. On the far side two north to south platforms have been terraced into the hillside on the west side of the gully, one above the other in 1 metre steps. The platforms or terraces are 15 metres and 20 metres long and 4 metres and 7 metres wide, but show no evidence of structures. Below the postulated house sites two east to west platforms about the gulley. The upper one, 15 metres by 6 metres, is poor; the lower is formed by a bank of earth and rubble 0.4 metres high externally but up to 1 metres high on the inner face. The interior 21 metres long and 7.5 metres wide has two partial subdivisions represented by parallel footings 2.2 metres apart rather in the nature of a stall. The building has an entrance gap 3.5 metres wide near the northeast corner. Remarkably large, the building may have been roofed or even a yard with pens, and its unusually good definition may imply later use. Immediately to the south is another platform 18 metres by 10 metres, but of no distinction, and lastly, towards the convergence of stream cuttings an east to west platform is cut into a local slope to a depth of 1.5 metres. Overall it measures 15 metres by 8 metres but some slippage has reduced the flat interior to only 9 metres by 4 metres and it may be the site of an outbuilding. The settlement may have comprised three houses and a half dozen ancillary structures of which the group in the eastern part are distanced from the house and clustered near the yard or paddock. Comparable small building sites seem absent in the western part of the complex. Houses and their stances do not conform by size or shape to the standard longhouse of Dartmoor and Bodmin Moor and may indicate a different and localised building tradition. All the visual evidence suggests desertion in the medieval period and it seems most unlikely there are no early references to the settlement unless it is the Hagley of the "Bagley and Hagley" steadings (MSO7338). <1> Royal Air Force, 1946 -1948, Vertical Aerial Photography, CPE/UK 1980 3174 & 4171 (April 1947) (Aerial photograph). SEM6707. <2> 1971, HSL.71-177 Run 89, SCPO. 8668 (Aerial photograph). SSO235. <3> West Air Photography, 1981-1983, Oblique aerial photographs across Exmoor National Park, 27534 (Aerial photograph). SSO705. <4> Aston, M, 1983, Deserted Farms on Exmoor and the Lay subsidy of 1327 in West Somerset, 71-104 (Article in serial). SSO742. <5> Quinnell, N.V., Field Investigators Comments, Ordnance Survey visit, 11 September 1987 (Unpublished document). SMO7320. <6> Riley, H., 1996, The Prehistoric Enclosures and Medieval and Post Medieval Settlements at Bagley and Sweetworthy, Luccombe, Somerset (Report). SMO5777. <7> Royal Air Force, 1947, RAF/CPE/UK 1980, F20 3237-8 (11 April 1947) (Aerial photograph). SDE60980. <8> Various, Various, Vertical Aerial Photograph, NMR OS/79014 050-51 (17 April 1979) (Aerial photograph). SMO4068. <9> Various, Various, Oblique Aerial Photograph, NMR SS 8942/19 (23826/23) (19 February 2005) (Aerial photograph). SMO4069. <10> Various, Various, Oblique Aerial Photograph, SS 8842/39 (23826/24) (19 February 2005) (Aerial photograph). SMO4069. <12> Various, Various, Oblique Aerial Photograph, SS 8842/38 (23831/24) (19 February 2005) (Aerial photograph). SMO4069. <13> Royal Commission on the Historical Monuments of England, Exmoor Project (Collection). SMO5831. <14> RCHME: Exmoor Pilot Survey, SS 84 SE, Somerset (Collection). SMO6274. <15> Sweetworthy Deserted Settlement/ink survey (Survey). SMO5443. <16> Hagley/ink survey (Survey). SMO5717. <17> Western Archaeological Trust, 1980s, Exmoor Aerial Photograph Survey, 8842 (Survey). SSO708. <18> May 1977, ENP MAM IRFC, 13,098 (Aerial photograph). SSO202. <19> Burrow, I., Minnitt, S. and Murless, B., 1982, Somerset Archaeology 1981, 85 (Article in serial). SSO856. <20> Somerset County Council Planning Department, Slide, 3.19.77, 3.19.83-84 (March 1984) (Photograph). SSO420. <21> Preece, A., 1993-1994, English Heritage Monument Protection Programme (Report). SSO1801. <22> English Heritage, 12/8/1994, English Heritage to Somerset County Council (Unpublished document). SSO1121. <23> RCHME, 18/7/1996, 1:500 (Map). SSO1853. <24> 10/1/1989, DAP LD28-34, LF17-19 (Aerial photograph). SSO113. 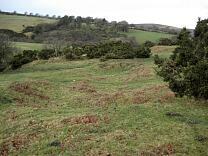 <25> Bray, L.S., 2010, Scheduled Monument Condition Assessment 2009, Exmoor National Park (Report). SEM7402. <26> Exmoor National Park Authority, 2009, Monument Management Scheme: 2008-9 Report, P. 13 (Report). SEM7897. <27> Gent, T. and Manning, P., 2015, Exmoor National Park Scheduled Monument Condition Survey 2015 (Report). SEM8278. SEM6707 - Aerial photograph: Royal Air Force. 1946 -1948. Vertical Aerial Photography. CPE/UK 1980 3174 & 4171 (April 1947). SSO235 - Aerial photograph: 1971. HSL.71-177 Run 89. SCPO. 8668. SSO705 - Aerial photograph: West Air Photography. 1981-1983. Oblique aerial photographs across Exmoor National Park. 27534. SSO742 - Article in serial: Aston, M. 1983. Deserted Farms on Exmoor and the Lay subsidy of 1327 in West Somerset. Proceedings of the Somerset Archaeology and Natural History Society. 127. 71-104. SMO7320 - Unpublished document: Quinnell, N.V.. Field Investigators Comments. Ordnance Survey visit, 11 September 1987. SMO5777 - Report: Riley, H.. 1996. The Prehistoric Enclosures and Medieval and Post Medieval Settlements at Bagley and Sweetworthy, Luccombe, Somerset. SDE60980 - Aerial photograph: Royal Air Force. 1947. RAF/CPE/UK 1980. Royal Air Force Aerial Photograph. 3086. F20 3237-8 (11 April 1947). SMO4068 - Aerial photograph: Various. Various. Vertical Aerial Photograph. NMR OS/79014 050-51 (17 April 1979). SMO4069 - Aerial photograph: Various. Various. Oblique Aerial Photograph. NMR SS 8942/19 (23826/23) (19 February 2005). SMO4069 - Aerial photograph: Various. Various. Oblique Aerial Photograph. SS 8842/39 (23826/24) (19 February 2005). SMO4069 - Aerial photograph: Various. Various. Oblique Aerial Photograph. SS 8842/38 (23831/24) (19 February 2005). SMO5831 - Collection: Royal Commission on the Historical Monuments of England. Exmoor Project. SMO6274 - Collection: RCHME: Exmoor Pilot Survey, SS 84 SE, Somerset. SMO5443 - Survey: Sweetworthy Deserted Settlement/ink survey . 1:1000. General: Permatrace. Pen and Ink. SMO5717 - Survey: Hagley/ink survey . 1:500. General: Permatrace. Pen and Ink. SSO708 - Survey: Western Archaeological Trust. 1980s. Exmoor Aerial Photograph Survey. 8842. SSO202 - Aerial photograph: May 1977. ENP MAM IRFC. 13,098. SSO856 - Article in serial: Burrow, I., Minnitt, S. and Murless, B.. 1982. Somerset Archaeology 1981. Proceedings of the Somerset Archaeological and Natural History Society. 126. 69-91. 85. SSO420 - Photograph: Somerset County Council Planning Department. Slide. 3.19.77, 3.19.83-84 (March 1984). SSO1121 - Unpublished document: English Heritage. 12/8/1994. English Heritage to Somerset County Council. SSO1853 - Map: RCHME. 18/7/1996. 1:500. SSO113 - Aerial photograph: 10/1/1989. DAP LD28-34, LF17-19. SEM7897 - Report: Exmoor National Park Authority. 2009. Monument Management Scheme: 2008-9 Report. P. 13.